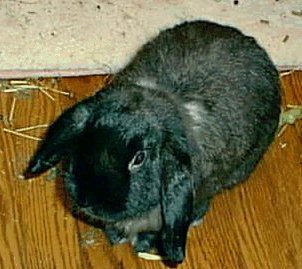 Very Sadly, Chocolate crossed over to the Rainbow Bridge on 12/19/98. He will be greatly missed. 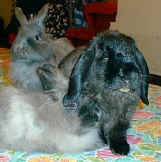 So what happend to Chocolate?...I spend time with my bunnies each day and they eat salad, pellets and lots of hay. Each day, I put this food in their room and each day all the food gets eaten. 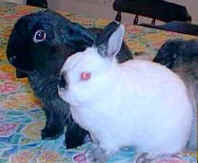 I didn't always pay specific attention as to whether each rabbit was eating or not. (I do now!) 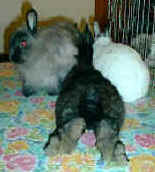 On 12/18/98 I went in the bunnies room and noticed that Chocolate didn't thump his feet and run from me as he usually does and when I looked over at him I could see something was wrong with his mouth. I picked him and flipped him over like a baby and cradled him in my arms and he didn't struggle to get away. His lower lip was all scabbed up and pulled down away from his teeth. I tried to get him to eat and drink but he wouldn't take anything. I got him in to the vet on the morning of 12/19/98 and at that time, I also noticed that his stomach felt hard. He spent 3 hours at the vet where he received fluids, had an x-ray of his stomach which showed alot of food in it and was given medicine to try and get his stomach moving again. I was told to force feed him some nutri-cal every hour and to give him fluids to keep him hydrated. I also brought the stomach motility medicine home with me to give to Chocolate. The vet felt that the scab on his lip may have been from him pressing down and rubbing his mouth on the floor due to the pain in his stomach. About 1 hour after I got Chocolate home, I tried to feed him his medicine and his nutri-cal and he was acting much worse. Within a half hour, Chocolate had stopped breathing and died quietly and peacfully in my arms while my husband and I pet him and talked to him. I am sure that Chocolate knew right to the end how much he was loved. For those of you not familiar with rabbits, they are wonderful loving little animals but like all animals there are some specific medical complications that they can have and should be watched for. After much crying and soul searching, I realize I did everything I could for chocolate but have also learned more of what to watch for in my other bunnies. I now make sure that each day when I feed my bunnies, I check to make sure everyone of them is eating and going to the bathroom. I feel their little tummies to make sure none are hard and at the first sign of any concern, I email all my friends at Petbunny and ask for help and advice as well as getting my bunny to the vet ASAP. Since Chocolate was the first bunny I have ever had with medical problems and that I lost, I was unprepared to deal with any emergencies. I now have a complete first aid kit for rabbits in my home that contains pedialyte (for necessary fluids), Mylicon drops (for gas pain relief), Kaopectate (for the runs), Nutri-cal (for nutrition), Syringes (for force feeding), Jars of baby food (to get nutrition in) and many other things. 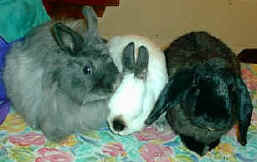 All these needed supplies can be found on the House Rabbit Society's Web Page. Thanks for listening to my story and I hope that if you have rabbits, it may be able to help you in some way with the care of yours.